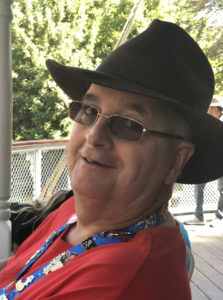 Timothy E. Fleck, 59 of Greenwood, NE passed away Sunday, November 11, 2018 at his home surrounded by his family. He was born April 5, 1959 in Omaha, NE to Fred and Patricia (Lewis) Fleck. Tim was a graduate of Millard Sr. High School. He worked as a custodian for Waverly School District 145 and at Camp Ashland. He was united in marriage To Jacqueline McCarty on June 6, 1984 in Lincoln, NE. From this union two children were born, Jason and Merrie Beth. Tim had a passion for trains, from collecting model trains to having a real life caboose in his yard. He was a member of the Burlington Route Historical Society. He was preceded in death by his, wife, Jackie Fleck; mother, Patricia Fleck, step-mother, Lanaya Fleck; brother Dan Fleck. So sorry for your loss. May God’s perpetual light shine on him and God’s peace and love surround his family and friends. Sorry to hear that Tim has passed away,know that his “spirit” lives on,and memories of him will stay in your hearts forever. Deepest sympathy during this difficult time. So very sorry to hear that Tim has passed away. Tim’s love of the Burlington Railroad and of U.S. Route 6 was exhibited often in his supply of pictures of the Ashland & Greenwood Depots, pics of the ‘original’ route of U.S. Route 6 (along Silver Street) in Ashland that became ‘collector’s items’ for the Ashland Historical Society website. Condolences & prayers for his family. RIP Tim. My prayers are with you all. Much love to all. So sorry to hear about Tim. I always remembered when he would come home to visit his parents and Kenda and I would run up to his car all excited to see him. By the time i was old enough to really kno him he was in his twenties and not around much. We will see you again soneday Cousin. our prayers to Jason and Merrie Beth.